Apparently no one can resist a country that stands for neutrality, security and peace. National pride remains at record highs. "Don't build your fence too wide." Brother Klaus (1417-1487), hermit and patron saint of Switzerland, is supposed to have given his countrymen this early warning to keep themselves to themselves, saying something along the lines of "Don't get involved in other people's affairs." His words are often quoted even today, and Swiss citizens allegedly swore an oath to them after losing the Battle of Marignano (1515). The neutrality that developed from those beginnings is for many a central component of the small alpine nation's success. Swiss neutrality was permanently established at the Congress of Vienna in 1815 by the powers that had defeated Napoleon, and with their guarantees of protection. Is Independence Still Relevant Today? Discussions of the origin, significance and nature of neutrality that arose at the end of the Cold War have once again gained new life with two anniversaries this year: 500 years since the Battle of Marignano and 200 years since the Congress of Vienna. And the most relevant question under discussion is whether Swiss neutrality is out of date. The Worry Barometer gives a clear answer: For the citizens who responded, neutrality is an unshakable value; they effectively named 2015 the Year of Neutrality. 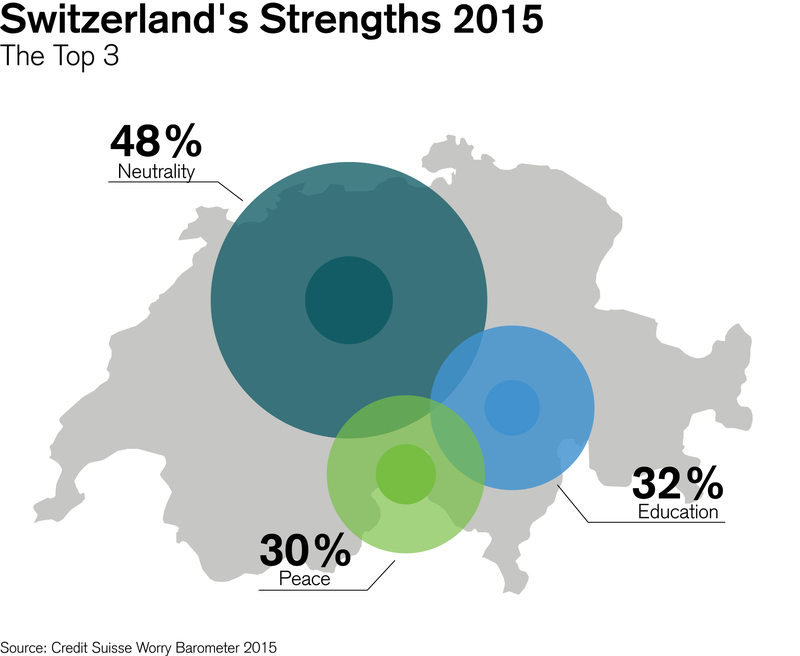 As in the previous year, 96 percent of respondents are proud or very proud of Swiss neutrality. What's more, fully 48 percent (+ 15 percentage points, or pp since 2014) view it as Switzerland's primary strength. Switzerland's widely praised role as chair of the OSCE mediation effort in the Ukraine conflict almost certainly contributed to this response. Finally, no other term was cited more often than neutrality at 32 percent (+ 12 pp; average since 2004: 20 percent) as one of the things that defines Switzerland. For 19 percent (+ 1 pp) of the citizens responding, Switzerland also stands for security and peace. That's not surprising since the average over many years was actually 22 percent. The landscape came in third as something "typically Swiss" for 13 percent of the respondents (- 1 pp; average since 2004: 16 percent). The related term "Alps/mountains" garnered just 5 percent this time (- 6 pp; average since 2004: 10 percent), not so high on the list. But at 12 percent (+ 7 pp; average since 2004: 7 percent) the banks took a big step forward. They are inseparable from Switzerland in the view of the electorate. Along with banks, "financial center" was also mentioned more often (6 percent, + 3 pp) than last year. Banking client confidentiality remained stable at 1 percent. The 21st century is characterized by pronounced Swiss national pride. Between 2004 and 2006, on average 75 percent of respondents were already reporting that they were proud of their country. By 2013 that average rose to 84 percent. Then in 2014 the "Swissness" trend broke through the 90 percent barrier, and it has now achieved a new height of 94 percent. Just how unique those numbers are becomes apparent when their opposite is considered. 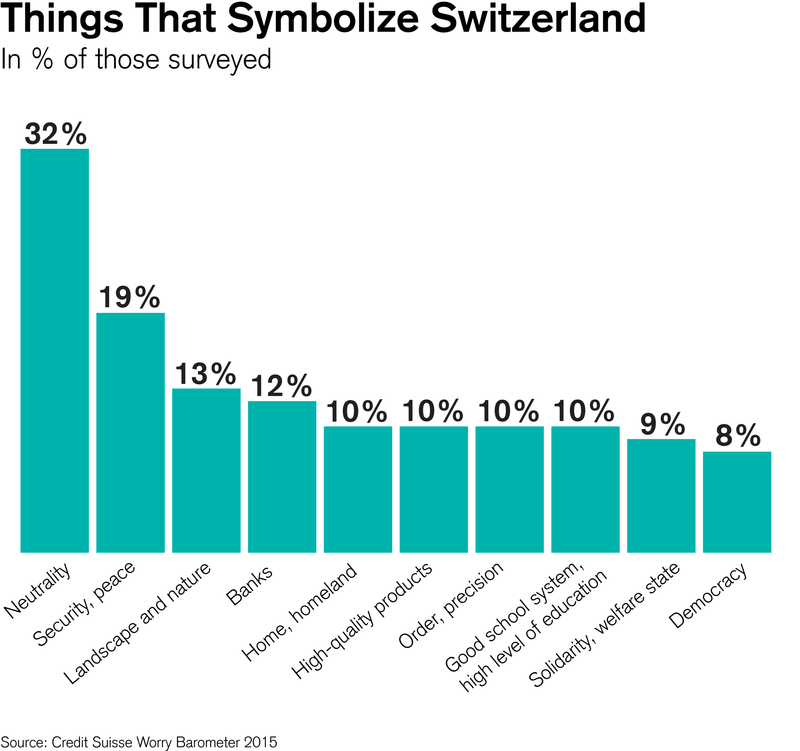 A mere 5 percent of respondents are explicitly not proud to be Swiss (1 percent gave no answer). French-speaking Switzerland and those on the political left are primarily responsible for that large increase. The difference between the proud German-speaking majority and the skeptical French-speaking minority averaged 29 percentage points over many years, but that difference evaporated in 2015. A similar development was evident among political trends. The difference between the right and the left previously averaged around 21 percentage points, but today they are almost even. And for the second time, the political center expressed the greatest national pride; normally the right leads them by a hair. Even more astounding is the development among another group who responded that they are "very proud" to be Swiss. While the difference between right and left was 41 percentage points in 2005, it is now just 13 percent – but in the opposite direction. Fifty-one percent of left-leaning respondents are "very proud" to be Swiss, versus only 38 percent of those leaning to the right (compared to 64 percent in 2009). The Swiss are particularly proud not only of their neutrality (96 percent very/somewhat proud), but also of the Federal Constitution (93 percent), people's rights (89 percent), independence (84 percent), federalism and coexistence (81 percent each). The numbers for consensus (79 percent) and the militia system and social partnership (77 percent each) were all somewhat lower. When evaluating the economy, that pride is concentrated on certain industries. Industries that are regarded as typically Swiss by large sections of the population usually enjoy a very good reputation. The watch-and-clock-making industry came out on top (97 percent of those asked are proud of it), ahead of "international reputation for quality" and "Swiss brands that are strong abroad" (96 percent each), SMEs and the engineering industry (95 percent each), and research (93 percent). The pharmaceutical industry and innovation came in slightly lower (at 89 percent each), followed by public service companies (88 percent). International corporations in Switzerland (82 percent), the financial center (80 percent), and banking confidentiality (78 percent) had high numbers but trailed somewhat. Political terms received a respectable average of 84 percent (- 4 pp) in response to the question of what one is proud of. Economic terms were ranked slightly higher, at 90 percent (+ 2 pp), although the political factors came in ahead of them in terms of Swiss strengths. According to these responses, the economy contributes greatly to the strength of national pride.